As you might already know, in Japan there are two main religions: Buddhism and Shintoism. The lines between these two religions are sometimes very blurred, and it’s hard to distinguish what part of a tradition comes from where. And at other times it is clear as day. One thing that is clear is the gods, or Kamis, of Shinto, with their leader at the top: Amaterasu (天照), or Amaterasu Ômikami (天照大神). The name Amaterasu can be translated into “shining in heaven”, and Amaterasu Ôkami can be translated to “Great Kami that shines in heaven”, and is a more than fitting name for the Shinto deity of the Sun and the Universe. It is also believed that the Emperors of Japan have all been direct descendants from Amaterasu. The oldest stories of Amaterasu can be found in the Kojiki and the Nihon Shoki (the two oldest records of Japanese history). She is the sister of Susanoo, the god of storms and the sea, and of Tsukuyomi, the god of the moon and the night. These three siblings were all born of a higher deity named Izanagi-no-Mikoto (one of the Gods that is said to have created the islands that today make up Japan) after he had been through the Underworld. While purifying himself, Amaterasu was born when he washed out his left eye, Tsukuyomi was born from the washing of the right eye, and Susanoo from the washing of the nose. It is believed that Amaterasu and her brother (and husband) Tsukuyomi, the god of the moon and night, where to rule the heavens together. However, one day Tsukuyomi killed the god of food, Uke Mochi, because he was disgusted with how she produced the food. (She either threw it up, or blew it out of her nose.) When Amaterasu found out what her brother had done, she refused to look at him, and labeled him as an evil god, and split night from day. The temple for worshiping Amaterasu is in Ise, in Mie Prefecture. It is said that the three Regalias of Japan, the mirror, the jewel, and the sword, are all housed at this shrine. Since Amaterasu is one of the three main Kamis in Japanese culture, she has also been the inspiration on popular culture. Her name appears as a fire technique in “Naruto”, and in “One Piece”. There are cards named after her in “Yu-Gi-Oh” and “Cardfight!!! Vanguard”. 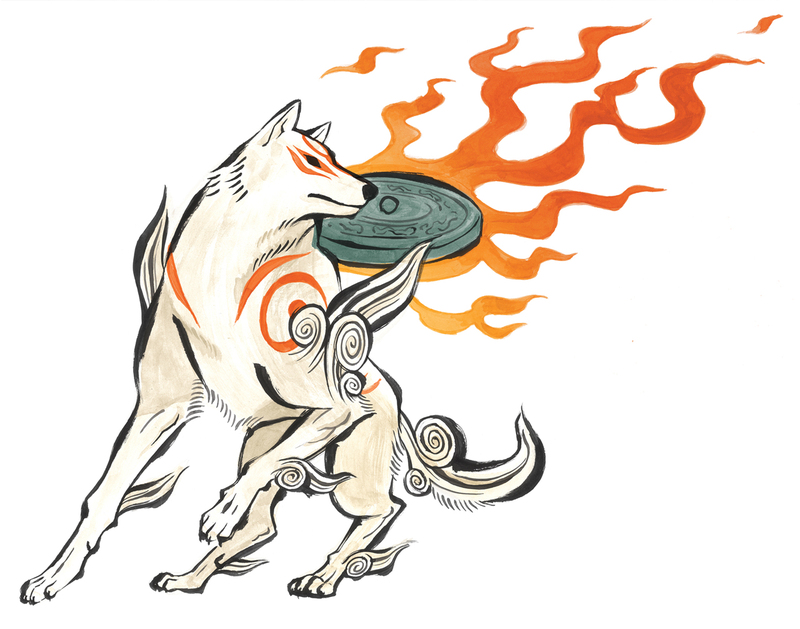 And the Capcom game “Ôkami” has Amaterasu herself as the protagonist, in her wolf-shape. Even the Canadian/American Sci-Fi-series “Stargate SG-1” has Amaterasu as a minor antagonist.